I heard about Extra Life last year on 680 News but was too late to participate (actually, I wasn't, now that I know). I tried to register then, but the site wasn't working properly, and then the whole thing slipped from my mind. By chance, digitaltempest mentioned it yesterday and, after supporting a friend's team, we decided to get our gaming butts in gear and do what we could with the remaining hours. Gaming is our life. There is no reason - no excuse! for us not to do it for such a great cause! 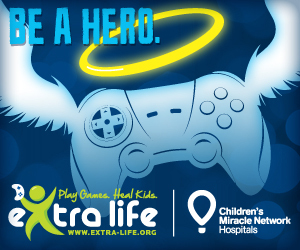 Technically, we'd already been playing that day, but not with Extra Life in mind. Once we decided to do this, Glitterbomb was born and Digitaltempest got to work on streaming and then she and I did some mad Asuran things in Guild Wars 2 while my husband continued his XCOM marathon. Sadly, we're not as young as we used to be and, with no preparation (read: gaming nap! ), we didn't make it past 3AM. With so little planning, we did not make our meager goal, but we've got the ball rolling with plans to make Glitterbomb a major thing for next year's event!